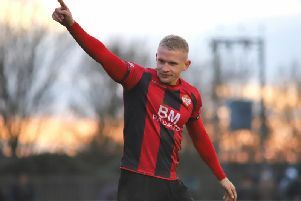 Lindon Meikle believes Kettering Town have hit a good run of form at “the right time” after they took a firm grip on the Evo-Stik League South Premier Division Central title race. Having moved back to the top after Tom Knowles’ last-gasp free-kick gave the Poppies a crucial 2-1 victory at high-flying rivals Stourbridge, they were at it again last weekend as another stoppage-time goal secured a 3-2 success over Needham Market at Latimer Park. This time it was Meikle who was the hero as he fired home the winner in the fourth of five minutes of injury-time. 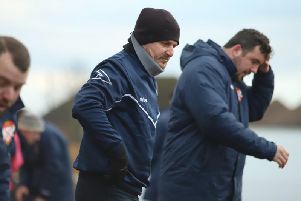 The victory was matched by a third defeat in a row for Stourbridge as they went down 1-0 at Lowestoft Town and it meant Kettering opened up a commanding five-point advantage at the summit while still having two games in hand on their nearest rivals. Marcus Law’s team now face back-to-back away matches with this weekend’s trip to Redditch United being followed by a clash at St Ives Town a week on Saturday. And Meikle insists he and his team-mates will just try to “tick” more results off as they push for automatic promotion. He said: “The lads are buzzing, I think we are hitting form again at the right time. “If you look back around Christmas, Stourbridge were the in-form team and beating everyone and I am sure people were looking at them as being the ones to go on and win it. “You had to hope that they would slip up at some stage and they have lost a couple while we have hit form. “We are dealing with the tough games and conditions and coming out with wins at the moment. Meikle’s dramatic intervention last weekend came after he had missed a chance in the final minute of normal time. But the Poppies are beginning to make a habit of scoring late goals in their quest for the title, having picked up 10 points thanks to stoppage-time strikes since the turn of the year. “The chance before came through someone’s legs and it took a bobble as I took a swing at it,” Meikle added. “So after that I wanted to make the most of any other chance I got. It’s always good to get a late winner and it’s a good habit to get into. “And everyone is chipping in. At Stourbridge it was Brett (Solkhon) and Knowlesy (Tom Knowles) and this time it was me. The whole team is pitching in which is good. “The conditions were difficult so there were a few mistakes out there but we are pulling through and coming up with the goods late on in games. “With the pitches at the minute, it helps other teams. If they come and compete and get a chance then they make it difficult for us. “But we just try to make sure we carry on until the end."